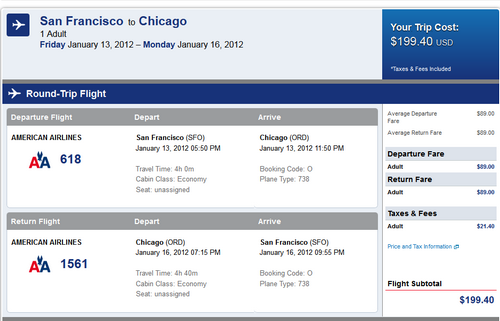 This is a great sale from San Francisco to Chicago. Also works from Chicago to San Francisco. Availability almost everyday of the week. At this price, this sale will not last. American allows you to HOLD the fare for 24 hours before purchase — so hold this and then firm up travel plans. January 13th – 16th (Martin Luther King Jr. Weekend). Valid for travel until February, 2012 with blackouts around Thanksgiving and Christmas. Use http://matrix.itasoftware.com and flexible month search to find exact availability. Must buy 10 days in advance of travel. SFO – ORD (Chicago – O’Hare) – SFO. Can also be routed via LAX (Los Angeles) for more miles.